Her (Sheikh Hasina) history may be a known one, but documentary drama “Hasina – A Daughter’s Tale” promises to traverse the unexplored bits and pieces of her powerful, yet graceful life. 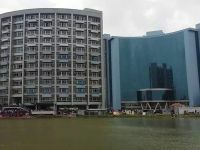 Its producer, the Centre for Research and Information or CRI, the Awami League’s research wing, organised a news conference to brief the media about the movie on Tuesday ahead of its Thursday premiere. “It occurred to me that why we don’t know that ‘Renu’ is the nickname of Bangabandhu’s wife (Sheikh Fazilatunnesa Mujib) or why don’t our girls follow the style of wearing saree beautifully by Sultana Kamal (Bangabandhu’s daughter-in-law)?” the docudrama’s Director Rejaur Rahman Khan Piplu of Applebox Films said. He said they had a team that had researched such issues extensively for the film. “Besides these, Sheikh Rehana (Hasina’s sister) comes here naturally. Because the two sisters are very close. They are very important parts of each other’s life,” he added. The movie will be launched at the Star Cineplex of the Bashundhara City, Blockbuster Movie at the Jamuna Future Park, Modhumita Cinema Hall at Motijheel in Dhaka and Silver Screen in Chattogram on Friday after the premiere at the Star Cineplex on Thursday. “This movie is not about the prime minister of the People’s Republic of Bangladesh, Sheikh Hasina – this is a movie about Sheikh Hasina, daughter of Sheikh Mujibur Rahman – a visionary, a revolutionary, a man who loved his nation more than anything else, a man who died for loving his nation,” reads a media release from CRI Executive Director Sabbir Bin Shams. “In her own words, we trace her transformation from a woman with a carefree, simple childhood who grew up among her friends at Azimpur Girl’s School changed into a leader determined to seek justice against those who conspired murdering 20 of her family members,” he added. The movie, produced by Rehana’s son Radwan Mujib Siddiq and Nasrul Hamid Bipu from CRI, is the outcome of an extensive five-year-long collaboration between the CRI and Piplu’s Applebox. Sadik Ahmed is the cinematographer of the movie edited by Navnita Sen. Debojyoti Mishra has directed its music.